Six Warriors delivered Warrior 53 from Bayview Yacht Club in Detroit to Northport, MI in the Great Lakes Warrior Sailing roll out. Page Sikes, an army veteran who had just returned from participating in a Warrior Sailing basic training camp, was waiting in the Northport marina at 2AM to welcome fellow travel-weary veterans on Warrior 53, showing the true camaraderie of the veteran’s sailing community. Warrior sailors of sister boat, Warrior 43, and Warrior 53 hosted a veteran’s sail day on July 8th in Centerpoint, MI and competed in local Wednesday night racing to raise awareness and demonstrate their sailing skills for interested guests. The team also met with local area veteran’s groups to raise awareness. The team of Warrior 53 will continue training then deliver the boat to Chicago for the Chicago to Mackinac Race. 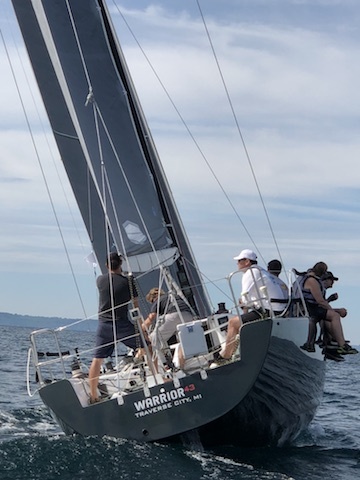 Warrior Sailor, Carlos Hernandez, on Warrior 53 said, “It was an amazing time with a great team delivering Warrior 53 on my first long distance sail through thunderstorm, swarms of insects, and two of the Great Lakes. I’m a different person since I began sailing, more active and happier.” Big thank you to Bayview Yacht club for welcoming warrior sailors and Warrior 53. Learn more about Warrior Sailing here.